Tomorrow is a big day for Lincoln, thanks to the Husker football team’s first game of the season against Nevada. I won’t make it to the game, but I do, of course, plan to watch. Duh. Are any of you going? If you go, do me a favor and watch the Tunnel Walk very carefully. Especially the part around the time that the team comes out. If my sources are correct, you may see a surprise or two. If you can grab it on video and YouTube it, even better. The Haymarket’s biggest building has been sold, and it will soon get a facelift to “give it more of a Haymarket feel”. The current Holiday Inn may even become a Crowne Plaza, giving it its fifth name in three-and-a-half decades. I’m curious about the exterior facelift to make it look Harmarket-y. Are they going beat the exterior with sledgehammers to make it look like it’s old and falling apart? 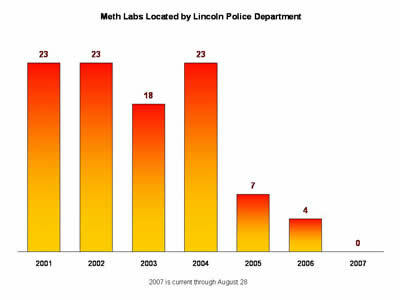 Looking for Meth in Lincoln? Sometimes data speak for themselves. From Chief Casady’s blog. I love Schlotzsky’s. I could eat there every week, easily. Unfortunately, ever since the location at 33rd and Pioneers closed, we Lincolnites have been stuck with only one impossible-to-access location at 27th and Superior. (Aside: The access problems at 27th and Superior are roughly analogous to those proposed by the city at 48th and O. Easy to see why businesses aren’t flocking there, no?) In addition, that location isn’t the most, umm, attractive or well-maintained location. Compare Lincoln’s dive with these nifty locations. Fortunately, it looks like my favorite place to eat with my eyes closed is in the midst of a minor makeover. There is new paint (plus wainscoting!) on the walls; new tile is going to be laid; and the whole place just looks fresher. On top of that, the staff were noticeably pleasant and happy when The Missus and I stopped by on Sunday. New management, perhaps? I can’t believe there is only one Schlotzsky’s in town. It really is a shame. If I had my way, there would be at least three locations in town: one on South 14th or South 27th; one on 84th Street near the new Wal-Mart; and a replacement for the current eyesore somewhere on North 27th (probably closer to the Interstate). I would even throw one in at 48th and O ... assuming that little access problem could be figured out. It’s not clear why, but a 30-year-old allegedly was seen circling a fountain near the Lincoln Children’s Zoo in his pickup Tuesday night. It was 10:20 p.m. when a zoo employee spotted him driving around Teacher’s Fountain, 27th and Capitol Parkway, and called police with a description of the driver, his pickup and plate number, Capt. Jim Thoms said. He said police went to the registered owner’s address at 2742 Cable Ave. and found the blue 2000 Chevy S-10 pickup with mud and grass on it. When they talked with the owner, Joshua Arney, he denied any involvement. But the zoo employee identified him as the driver, Thoms said. Police cited Arney on suspicion of vandalism — and reckless driving. Damage to the shrubs and landscaping was estimated at $100. Congratulations to Union College for reaching the 1,000 student mark, after seeing numbers almost half that size a decade ago. Do we have any Union College alum among our readers? I really don’t watch a lot of TV, but am looking forward to the fourth season of The Office in September. Yep - the preview trailer just came out. This summer has been a TV wasteland, as it should be and normally is. The only good show that has been on has been Top Chef. The Planning Commission will consider blighting some 400 acres west of the Haymarket today. Actually, they will just make a recommendation; the City Council will have to make it official. A blight designation will allow tax increment financing (TIF) to kick in, which will likely be very important for building a new convention center and arena. Note that, unlike the Antelope Valley Project, this project will almost certainly require a public vote at some point. Mayor Beutler will give his State of the City address tomorrow at 3:00pm. How do you perceive the state of the city? I didn’t blog about this earlier because I figured the article would eventually show up online. So far, no dice. That means firefighters’ promise to voters in 2001—that they would handle the ambulance service “faster, better and cheaper” than the private company that had it—has failed on at least two of those counts. On the plus side, data show that the first paramedic on the scene arrives by firetruck within 8 minutes 95 percent of the time. Business is booming at the College of Hair Design, so they are expanding to a second location. The location next to Menards and Wal-Mart seems a little odd to me, but hey, what does this bald guy know about hair anyway? I am ashamed to admit that I have lived near 48th and Highway 2 for over three years, but it wasn’t until Saturday that I first visited Smokehouse Deli (between Cappy’s and Midwest Seafood). I will go back. Soon. I was hungry after reffing two youth soccer matches, and I needed something to fill my belly because I had two more soccer matches to ref later that evening. Barbecue sounded good, so I narrowed my choices to Paul’s (48th and Pioneers) or Smokehouse Deli. I’m normally hesitant to try anything new—especially when my other option is as tasty as Paul’s—but on Saturday I was in the right mood, I guess. The moment I walked in the door I knew I was in the right place. One smell told me all I needed to know: I was going to like this place. I was feeling indecisive, so I asked the woman behind the counter what I should order. She didn’t completely bail me out, but when she pointed to a tasty looking rack of ribs, I took the bait. There was no way I could finish 14 bones, but I figured I’d have the rest on Sunday. When I told the woman I had never been to Smokehouse Deli before, she tossed in 3 smoked wings for free. Add in a few containers of their whiskey bbq sauce and a half-pint of beans and I was good to go. When I got home I tore into the meal with enthusiasm, and boy oh boy it was just as good as the smells had promised. I can’t believe I have lived so close to something so delicious for over three years and I’ve only once taken advantage. Shame shame. Smokehouse Deli is primarily a take-out joint, so don’t go in expecting to hang out there. Get your grub and go. Oh, I also asked if they do good business on Husker game days. They do. So good, in fact, that they recommend getting your order in by Tuesday to ensure that they’ll be able to cover your order. The first Husker game is this weekend. 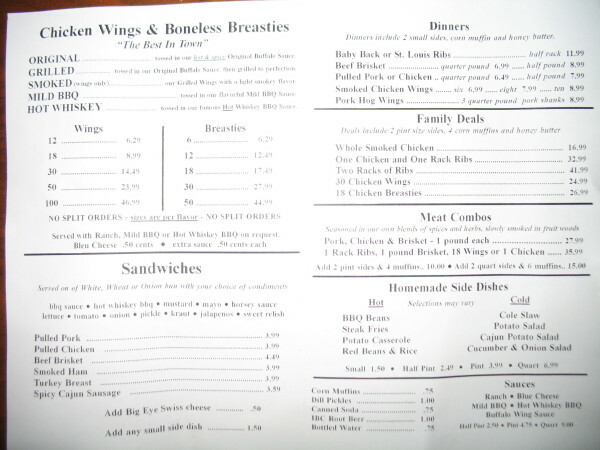 Why don’t you give them a call at 420-7675 and taste their meats for yourself? Niles Ford is Lincoln’s new fire chief. He begins work on October 1. What would you like to ask or tell him? The 2007 One Book, One Lincoln selection has been made. Chosen was The Worst Hard Time: The Untold Story of Those Who Survived the Great American Dust Bowl, the non-fiction tale of ... well, you read the subtitle. I have never participated in OBOL, but The Missus tries to read some of the nominees each year. Upon reading the winner announcement this morning, she laughed. “They picked the one book I had absolutely no interest in reading,” she said. Apparently one of the early descriptions she read included the scary adjectives “epic” and “long”. She figured if the number of pages was one of the book’s primary selling points, it wasn’t a book she cared to read. Do any of you plan to participate in OBOL this year? Have you already read The Worst Hard Time?